Fourteen Mock Trial competitors stood up. Some were clad in sleek, black suits, others in silky blouses and skirts. A hush came over the courthouse room. Tense but excited, the Developing Virtue Mock Trial team introduced themselves calmly to the court. Five months of preparation preceded the big day. The DVGS Mock Trial club split into two teams, Prosecution and Defense, which practiced against each other at club practices. Back in December, the club had scrimmaged against Las Plumas High School and Upper Lake High School. When the competition day rolled in on February 23, 2019, the team was set. They arranged exhibits of evidence from the crime scene in the courtroom and asked their teammates for last-minute suggestions. At the arrival of the judge, the nervous chatter in the room dissipated, leaving a suspenseful stillness. With confidence and composure, the DVGS witnesses acted their parts as college students, bosses, victims, or others. The attorneys interrogated the witnesses on the other side and objected firmly to the opposing attorneys’ sly questions. Lunch was pizza and sushi. Fresh out of the courtroom, the students discussed the morning’s proceedings animatedly over the mouth-watering food before the afternoon competition started. After the afternoon session, the students returned home, chatting about the overwhelming but enlightening day. Moniques Nguyen played two roles: the fictional defendant Reagan Klein (the person accused) and the victim (Sawyer Smith). She remarked that she felt the event was very formal and that she could have been better prepared. One student mentioned that competing against another school gave her more insight on questioning tactics and acting skills. Senior Cindy Han related how her experience in Mock Trial improved her leadership and public speaking. “I was pushed out of my comfort zone. I also discovered that there were a lot of amazing people at school,” she added, describing her admiration for her team members. In the courtroom, the Mock Trial team spun impressive counterarguments and spontaneously answered the judge’s questions. Yet much work was behind their professionalism and strategy. In the end, the most important reward from their efforts was one of internal growth and team progress. 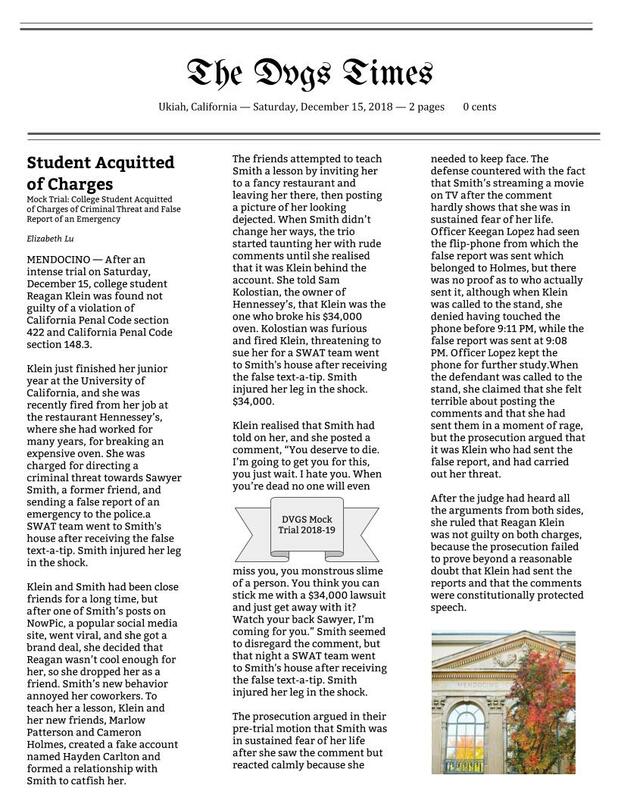 Read more about the trial details in the news article “Student Acquitted of Charges” by DVGS courtroom journalist Elizabeth Lu.